You will probably like this game if you like the Tron movie. Tron is the famous game from the Tron movie ported to the Zaurus. Two players move on the game board drawing lines. 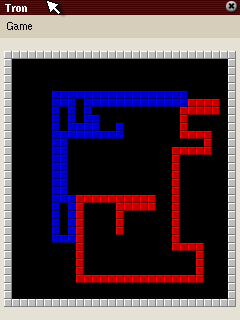 The objective of the game is to avoid hitting any wall or line drawn by you or the computer opponent. The Tron game is based on a very popular and well known game principle implemented in a lot of computer games. The game idea is simple, yet hunting each other on the game board trying to encapture the	opponent so that he/she is forced to run into a wall is intriguing. However, the computer AI is playing not very cleverly and therefore making it easy for you to win. And as you cannot play against a human opponent you have no other choice left than to play against the computer. Although sufficient for such a game, the graphics is nevertheless a bit simplistic.